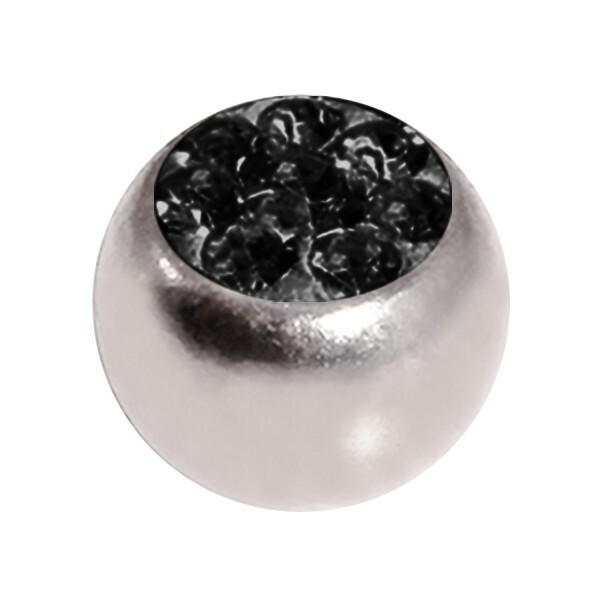 Only Piercing Replacement Ball w/ Black Strass Crystals. This body jewel only piercing replacement ball w/ black strass crystals made in 316L Surgical Steel & Strass, of Round shape, with Black as the predominant colour, and with Metallic as a secondary colour, which the material of the base is 316L Surgical Steel, and which the material of the ornament is Strass is proposed to you in 1.6mm/14G size and with a 06mm ball. There are 10 other versions of this product: white, dark green, light green, purple, red, pink, dark blue, turquoise, light blue and rainbow. This product is often bough with piercing only ball replacement w/ 5 red rhinestones and black bioflex push-fit piercing only head w/ rainbow strass.